Listening: Listening to songs on you tube to decide our wedding string quartet "playlist". I was never much of a "strings" person (played the saxophone growing up and like piano) ...but songs sound AWESOME on strings! Who knew? I am searching popular "pop" songs on YouTube to ask our string quartet to play for the wedding ...and am getting excited about our picks! Needing: to finish planning two GT units for January. I planned out my lesson plans and units the old fashioned way (on notebook paper) during my vacation on the beach. I have two units in the works to teach in January/February...a language arts fiction writing unit for my grades 3-5 students and a STEM unit for my grades 6-7 students. Look for more information on them later this month on my blog and TpT Store! Wanting: our traditional Florida trip with the family was special ... I am wanting to go back! 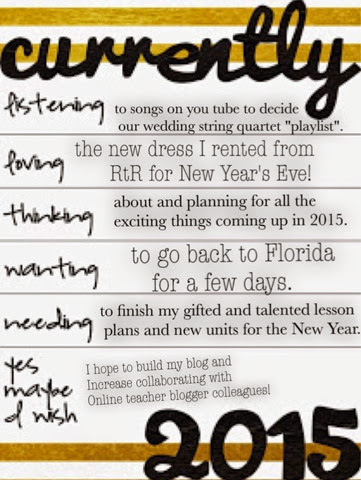 A Wish: I have been working hard on growing my blog again and reconnecting with an online community of teachers (also through instagram and tpt) ...I hope and wish that this growth only continues in 2015! This is the first time I've seen your blog. Super cute design. I majored in fashion and know about Rent the Runway but never knew someone that actually tried it. What designer did you rent? Happy New Year! Good luck with your planning Courtney- I'm putting that off for another few weeks. Happy New Year and all the best for 2015. I have never heard of renting clothing?! Well, except Tuxedos. I must google this. I hope you had a great NYE! @ Destiny - Thanks! I ordered a Twelfth Street by Cynthia Vincent "Confetti Printed Shift". It was not my normal style, but it is always fun to try something new! @Bec - Thanks! You too! @Alexis - Thank you! Love love your new blog design!! yay! I am so glad I found your blog! I feel like excellent middle school blogs are hard to find; I'm excited to be following you! Happy New Year!